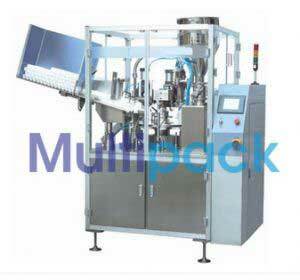 Automatic Single Head Tube Filling Sealing Machine Model No. SBTFS-50A GMP Model is very simple to operate, it consists mainly, one rotating disc with interchangeable tube holding sockets for different size of tubes. Only empty tube should feed manually, after that all process like filling, closing, coding & ejection process is automatic. Speed 40 to 45 tubes /min filling capacity. Tube Size dia. 12 min to 25 max. Tube Size length 50L min to 150L max. Net Weight 385 Kg. (Apprx.). Gross Weight 480 Kg. (Apprx.). Design confirms to GMP Norms. Contact parts of SS 316. All operation is fully automatic. Operating panel with START, STOP & INCH. 23 liters container acid proof. No tube No fill mechanism. Blow off for connection to local comp. air supply. Hinged Cassette Tube in feed system. All moving parts are guarded and enclosed. One set of first aid spares. Jacketed SS hopper, having heat control arrangement with thermostat to maintain the desired temperature. Attachment for cleaning of tubes by vacuum system. Complete extra pump unit in Stainless Steel. Set of Tube holder for diff. dia of tube. Vacuum Cleaning Device by compressed air supply. Coding device for one side coding with 10 figures. - Temperature regulator for heating element. - Mechanical lifting of heating element. - Device for coding one side with 10 digits with trimming of blades.